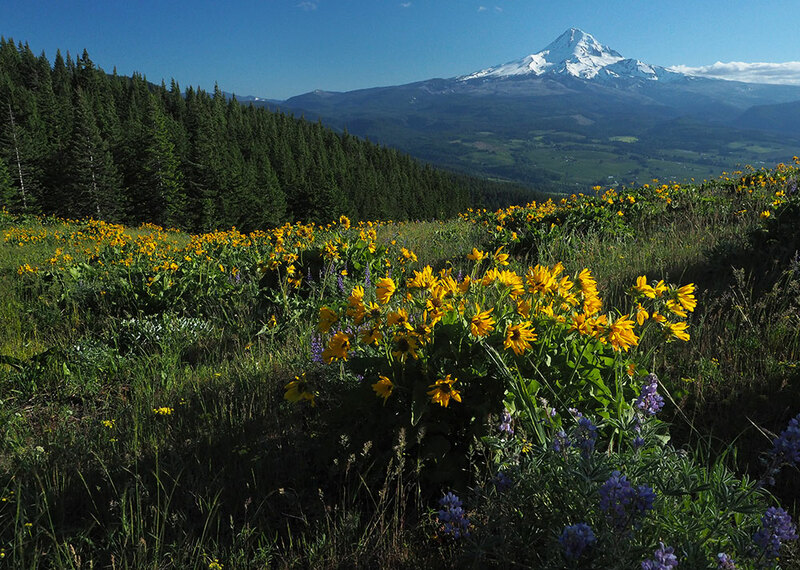 The country is filled with “Bald Mountains”, but for sheer scenic spectacle, few can compare to the Bald Mountain that rises just four miles away from the towering west face of Mount Hood. 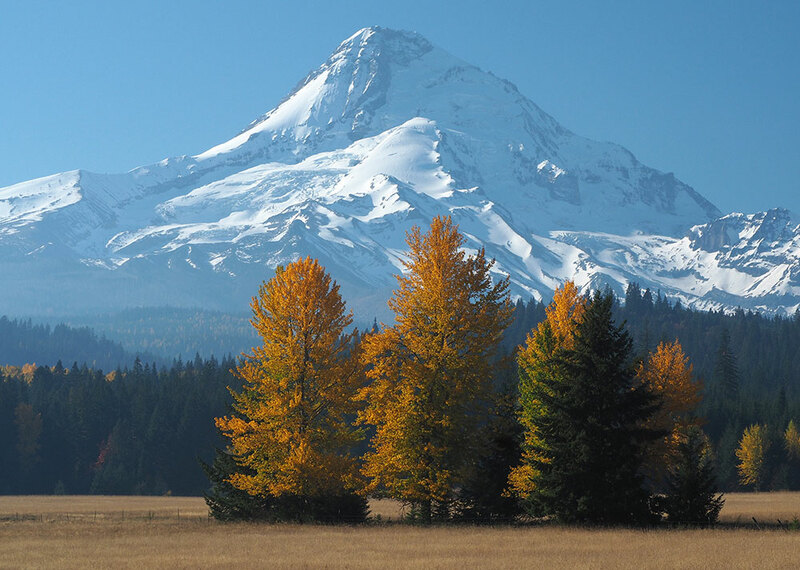 At one time, a fire lookout stood atop this Bald Mountain, and the view from the tower must have been the envy of fire lookouts around the Northwest. 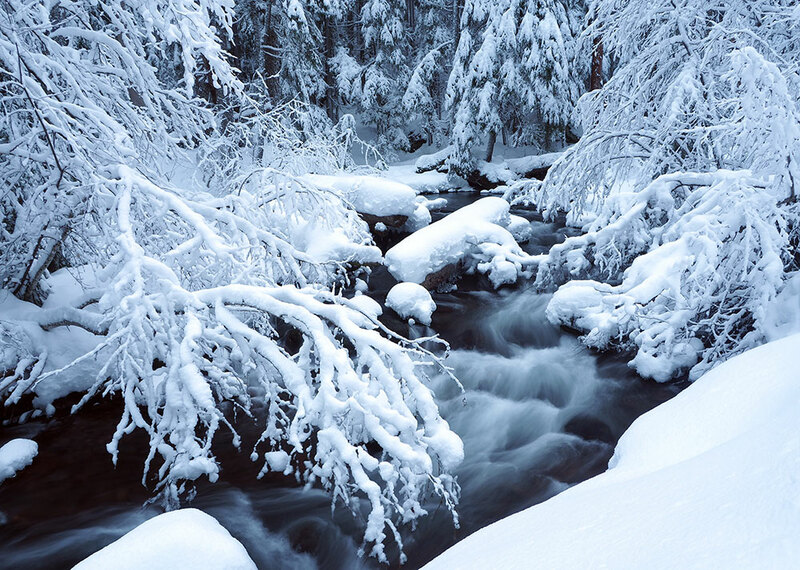 Today, Bald Mountain isn’t entirely bald, having grown a dense forest of noble fir along the crest and northern slopes over the past half-century. 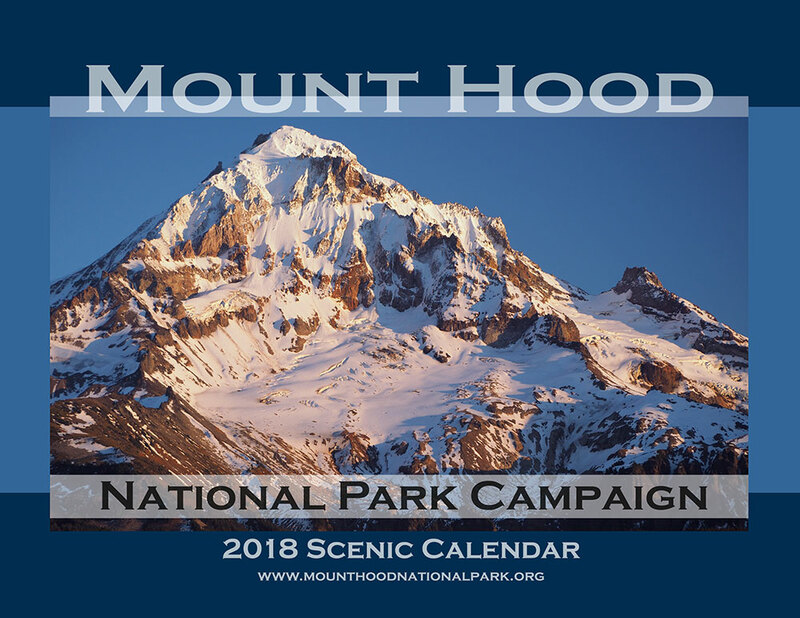 Yet, it was in the 1970s, when the Timberline Trail was rerouted to lead hikers across the steep, open meadows on the south slope of the mountain, that hikers became familiar with Bald Mountain. Today, this spectacular traverse continues to provide one of the most popular, exhilarating sections along the classic loop hike. 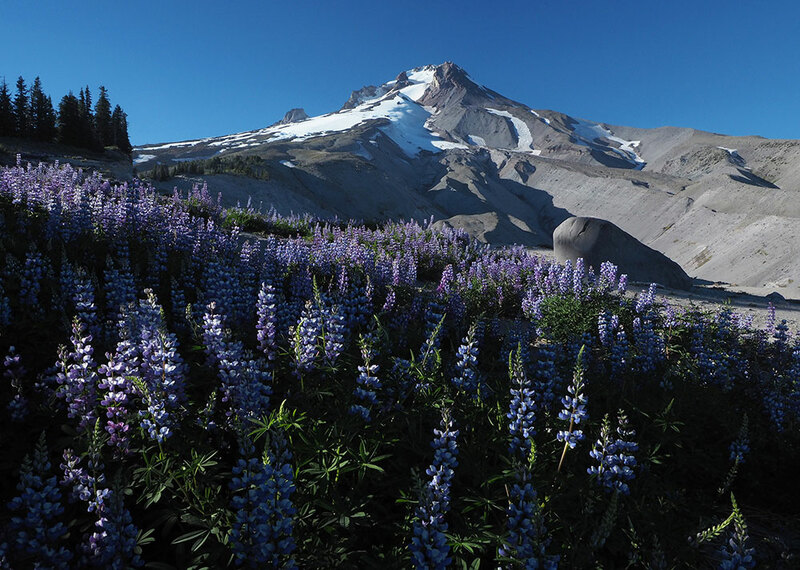 Though most visitors to Bald Mountain keep to the Timberline Trail, you can still follow the historic old path that leads to the former lookout site, with its magnificent, close-up views of Mount Hood. 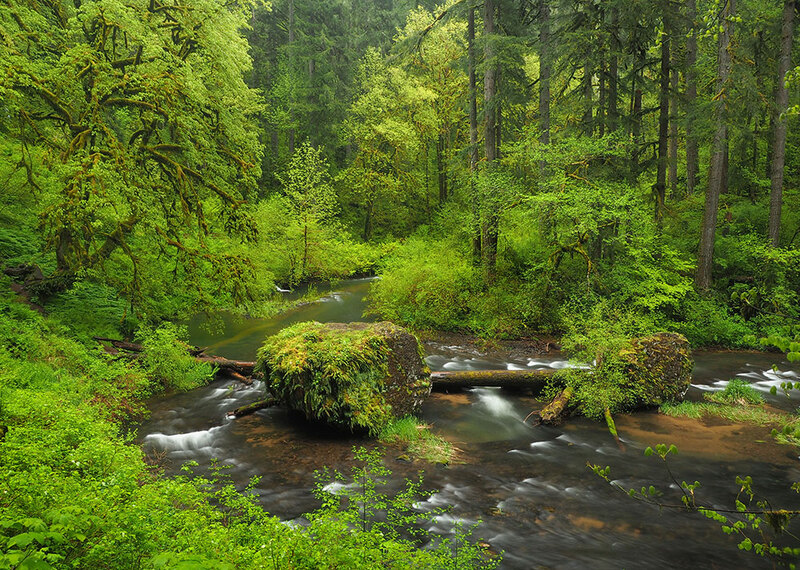 Thanks to the quiet efforts of a few anonymous volunteers over the decades, the trail remains open and lightly maintained, with only an occasional log to step over along the way. 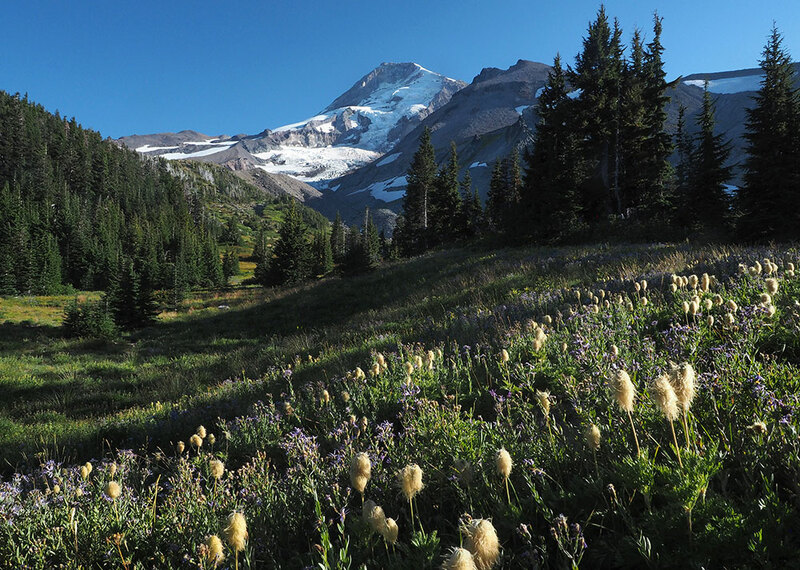 As the old path climbs toward the summit, hikers find themselves in a dense, young forest, and have to use their imagination to picture the open slopes of beargrass — with no forests — that existed when the first lookout was built on “Bald” Mountain more than a century ago. 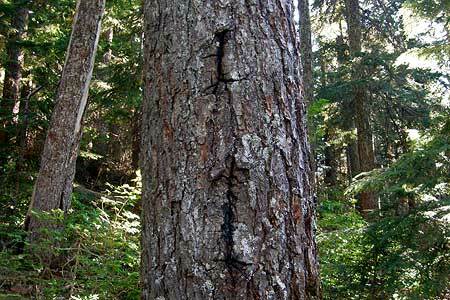 Along the old trail, hikers will also spot blazes on the few trees that stood at the time of the former lookout tower. 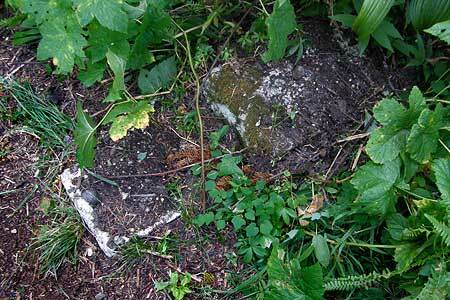 These blazes mark most historic trails (see this recent article on blazes) in the Mount Hood area, and confirm that the present alignment of the summit path to Bald Mountain dates back to at least the World War II era, and likely before. 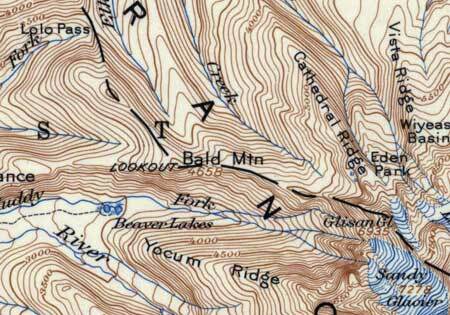 The 1946 USGS map of the Mount Hood area (below) is the last to show a lookout on Bald Mountain (and the Beaver Lakes), but in the intervening years from the 1911 map, the Timberline Trail and Skyline Trail had been completed, with both routes passing just below the lookout. 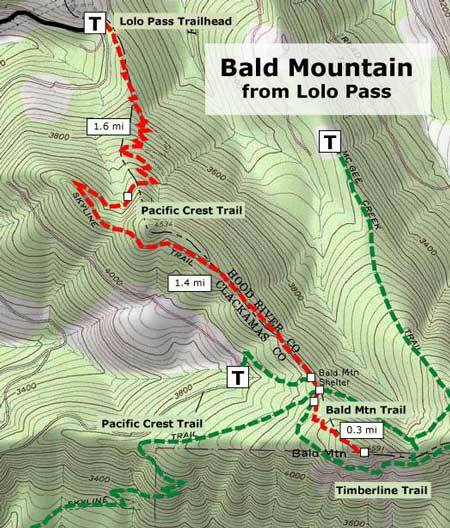 In fact, it’s likely that the section of Skyline Trail from Lolo Pass to Bald Mountain was originally built for lookout access, since the trail over Lolo Pass was among the earliest built in the area, and in fact, followed an ancient Indian route connecting the Sandy and Hood River valleys. 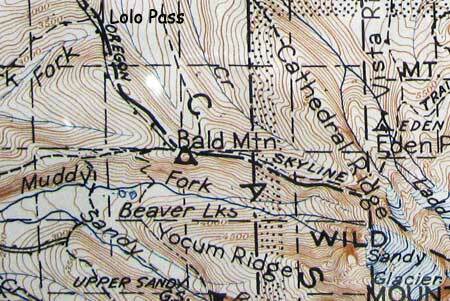 The alternating ticks shown along the dashed trail segments on the 1946 map indicate a telephone line along the route. Today, these routes often have ceramic insulators still attached to trees, and on this route further suggest that this section of trail was originally built with the lookout in mind. 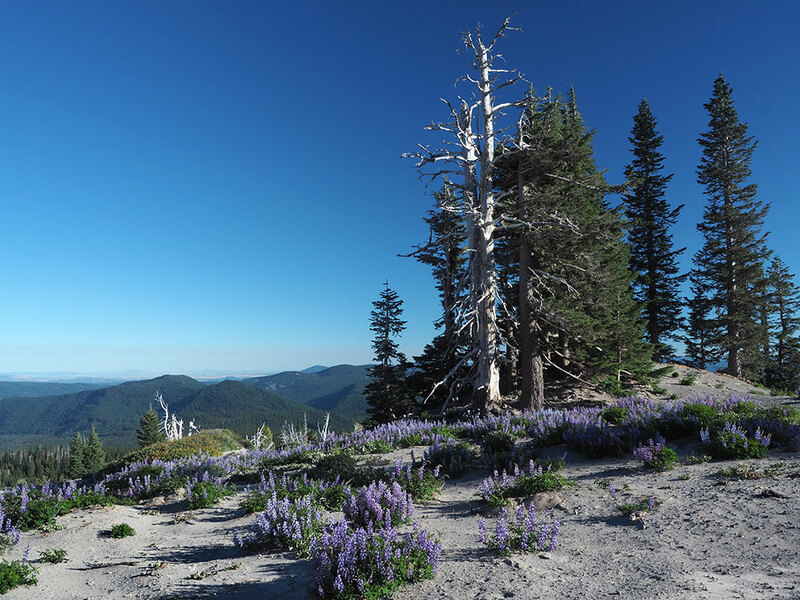 The route is now part of the Pacific Crest Trail, which replaced the old Skyline Trail, and remains one of the best approaches for hiking to Bald Mountain. What did the old tower look like? Fire lookouts in the Pacific Northwest followed a few standard designs beginning in the 1930s, after much improvisation in the early lookout designs that were built through the 1920s. 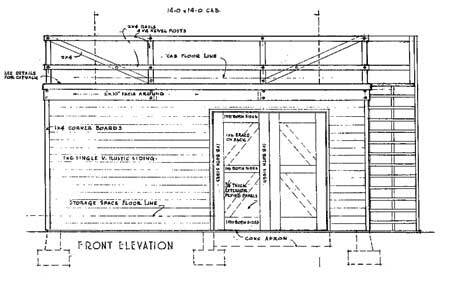 The Bald Mountain lookout probably followed this evolution, with some sort of simple platform beginning at the turn of the twentieth century, and later, a more substantial structure built to Forest Service standards. We have a much more exact picture after June 1944, when archived Forest Service documents show a new lookout was designed, apparently to replace an existing structure on Bald Mountain. The following are samples from the 1944 architectural plans for Bald Mountain. 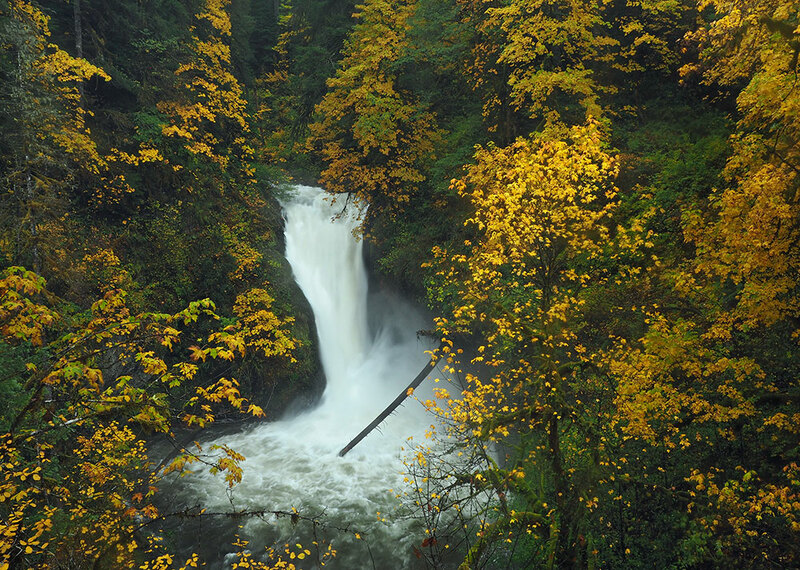 There are no clear records of when this lookout was removed, but it was likely in the late 1950s or 1960s, when hundreds of lookouts were viewed as outmoded by the Forest Service and destroyed. 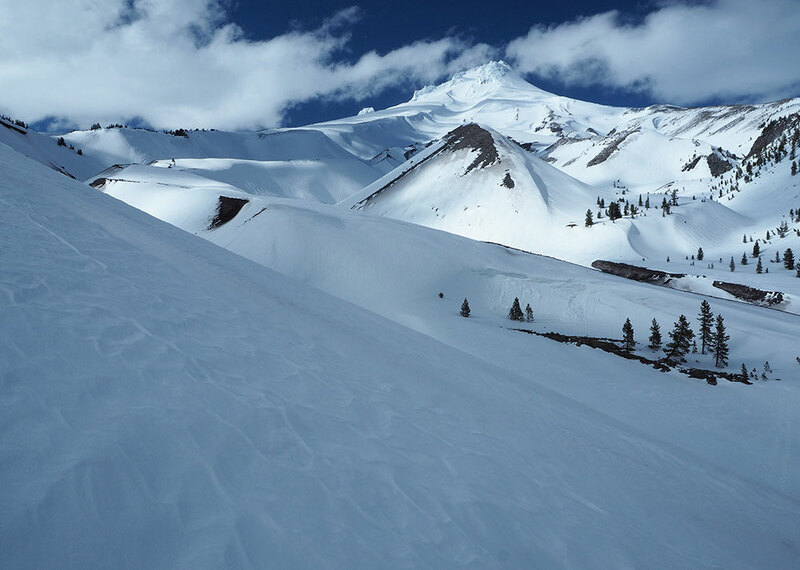 The cab — or cabin — in the 1944 designs for Bald Mountain is a 14×14 foot structure (above) that would closely resemble the surviving cab on the Devils Peak lookout, just to the southwest of Mount Hood in the Salmon-Huckleberry Wilderness. 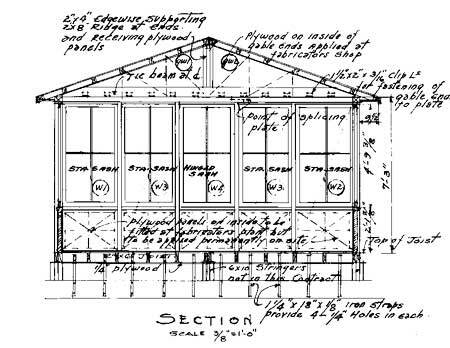 This simple design featured five windows per side and a low, pitched roof. 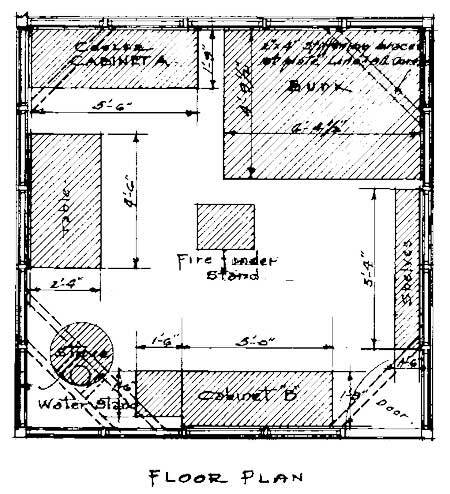 Inside the cab (below), the living space was organized around a Osborne fire finder, located in the center of the floor, surrounded by a wood stove, table, kitchen, storage cabinets, shelves and bunk. A catwalk wrapped around the outside of the cab, allowing lookouts to maintain the windows, raise and lower shutters and haul firewood and supplies up from below with pulleys. The 14×14 foot cab rested atop a 43-foot wood-frame tower (below), complete with a spiraling stairway that ascended within the tower uprights. 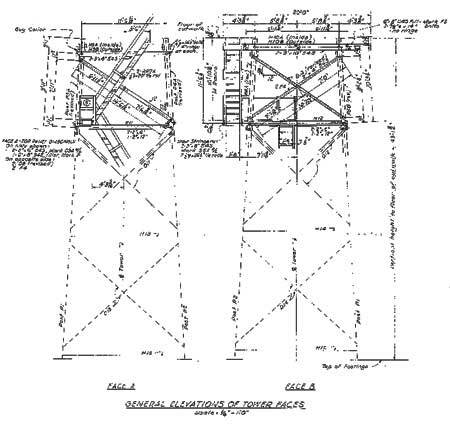 Though the tower was anchored directly to the ground, the main stabilization came from guy wires anchoring the tower to concrete footings in four directions. The most remarkable aspect of this tower (and many others) is the fact that most of the materials were carried to the site over trails using livestock. That included the cut lumber, concrete, construction hardware, fixtures and windows — an amazing feat when you consider this was repeated dozens of times at lookout sites around the region. There is some irony in the historic Bald Mountain trail being “lost”, as the mountain is now almost completely circled by the Timberline Trail, and thousands of hikers make their way along this route every year. 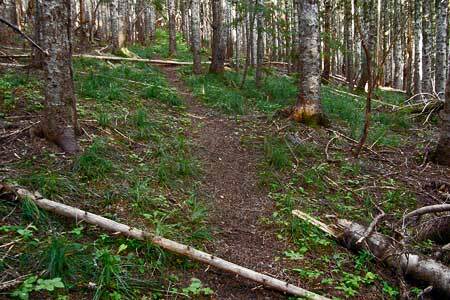 Almost all of these visitors walk right past the unmarked summit path leading to Bald Mountain. 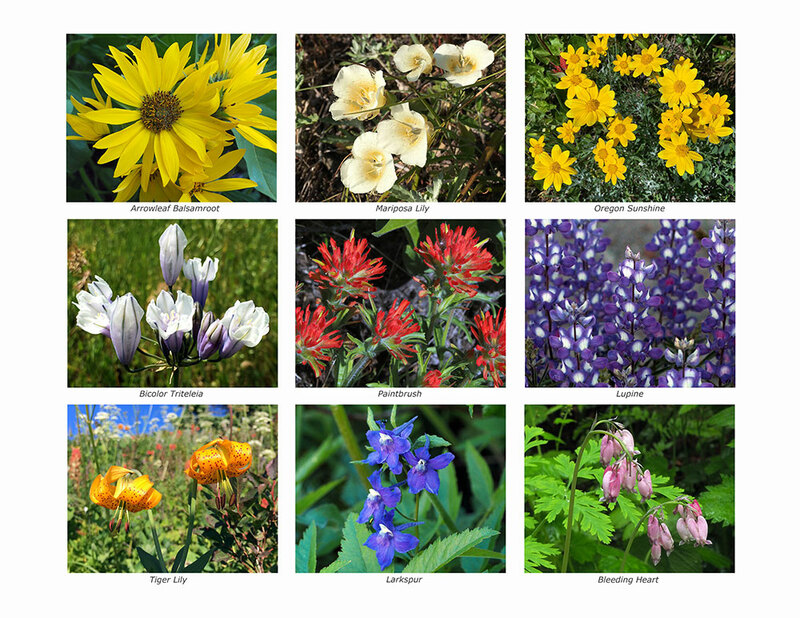 The Field Guide description also includes driving instructions to the trailhead. 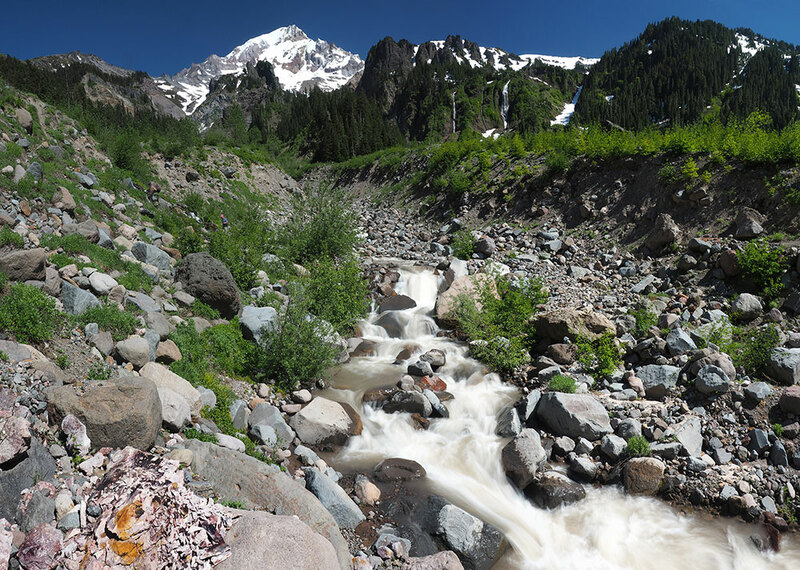 This is a dry hike, so carry water — and in early summer, plan on the usual bugs that plaque hikers just after snow melt. My favorite time to hike this trail is on a clear day after the first autumn snow dusts the mountain in late September or October. 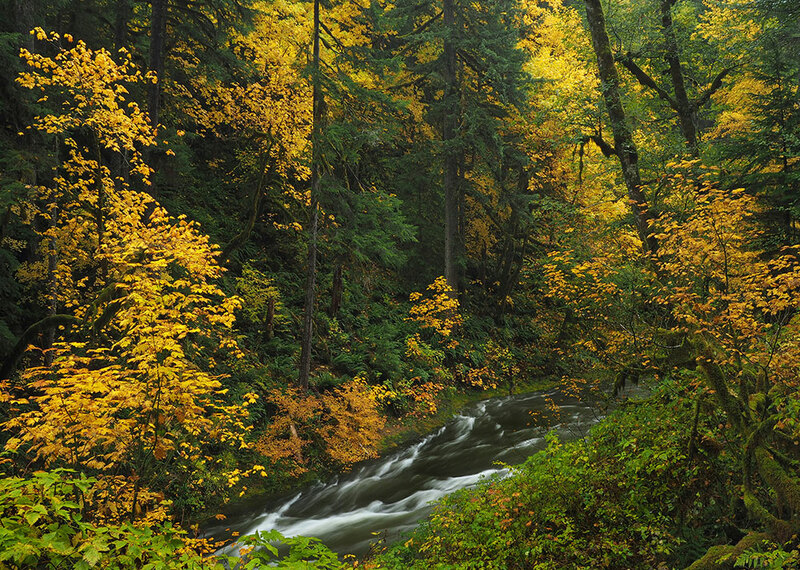 This is when the area is free of bugs AND crowds. 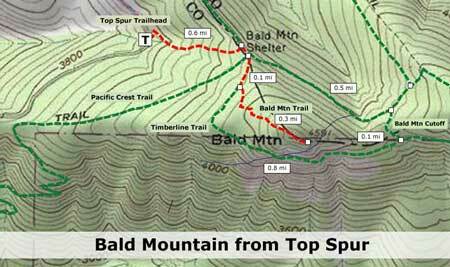 For a shorter hike that works well for families with kids (or for adults looking for a short afternoon or evening activity) you can also approach Bald Mountain from the Top Spur trailhead. 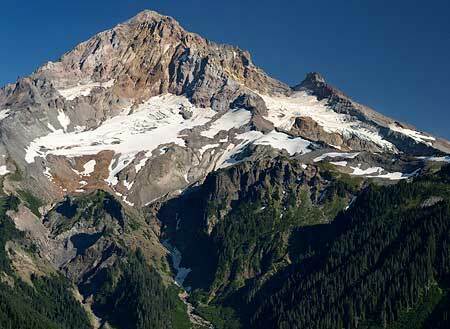 Be forewarned that this is one of the most popular trailheads in the Mount Hood region, and mobbed on summer weekends. But even on busy weekends, you can smile to yourself as you leave the crowds behind, and head up the quiet, old lookout path for some solitude — hidden in plain sight! From the summit viewpoint, you can literally look down on hikers passing hundreds of feet below on the Timberline Trail, oblivious to your presence. 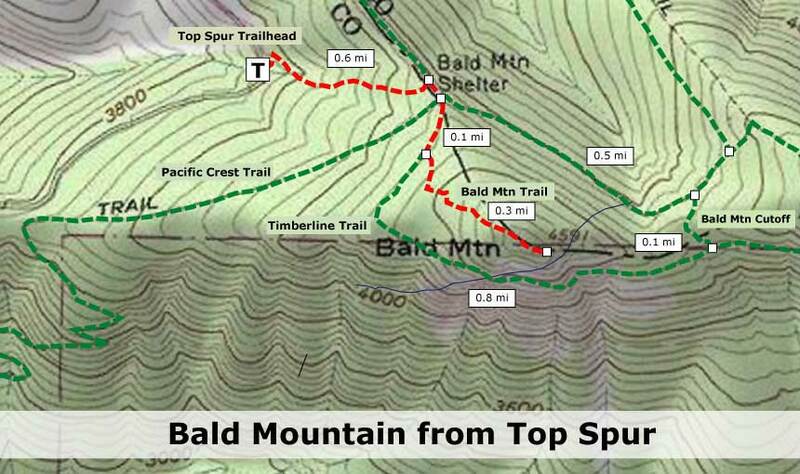 The Top Spur option is just two miles long, round-trip, with an elevation gain of 550 feet. 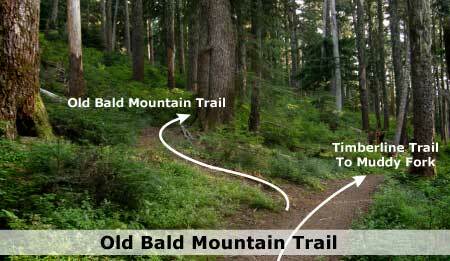 Though short, portions of both the Top Spur and Bald Mountain trails are steep, so you will notice the elevation gain! 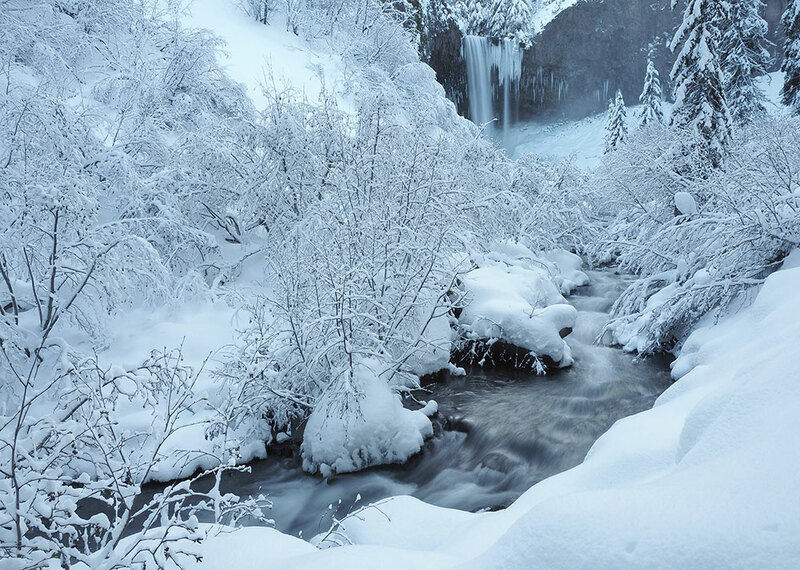 The tradeoff for kids is the feeling of climbing a real mountain. 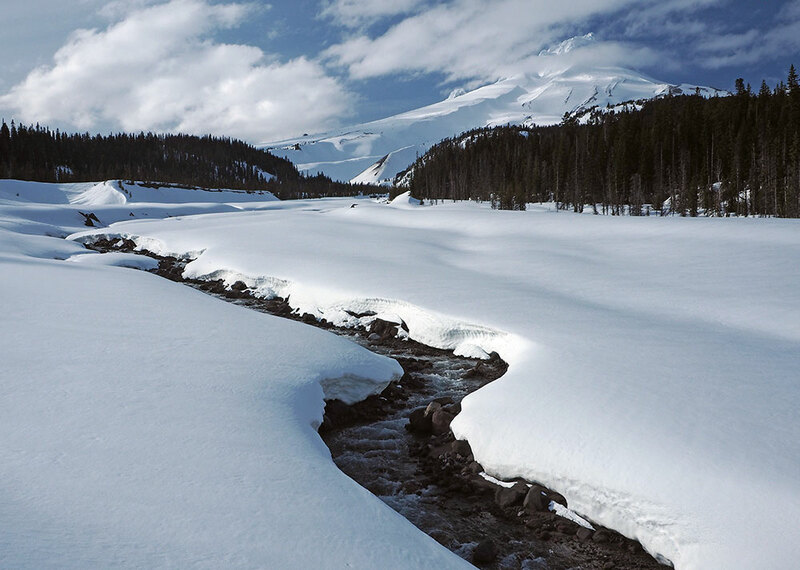 Bring a pair of binoculars for kids to explore the details of Mount Hood or watch hawks float across the Muddy Fork Valley, below. 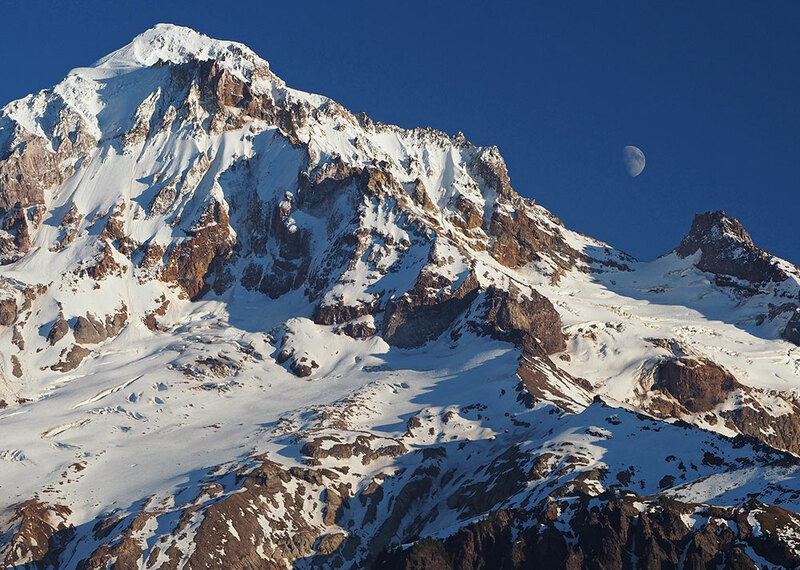 One of the most magical times to visit Bald Mountain is evening, when you can watch the awesome west face of Mount Hood light up at sunset, but still have enough light to hike back to the Top Spur trailhead. 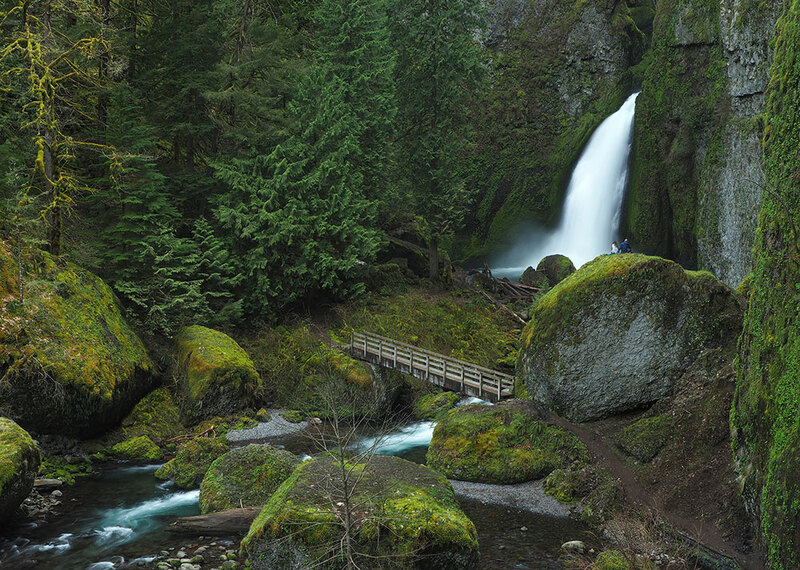 Both hikes are usually open from mid-June through mid-November, and both require a Northwest Forest Pass to park. 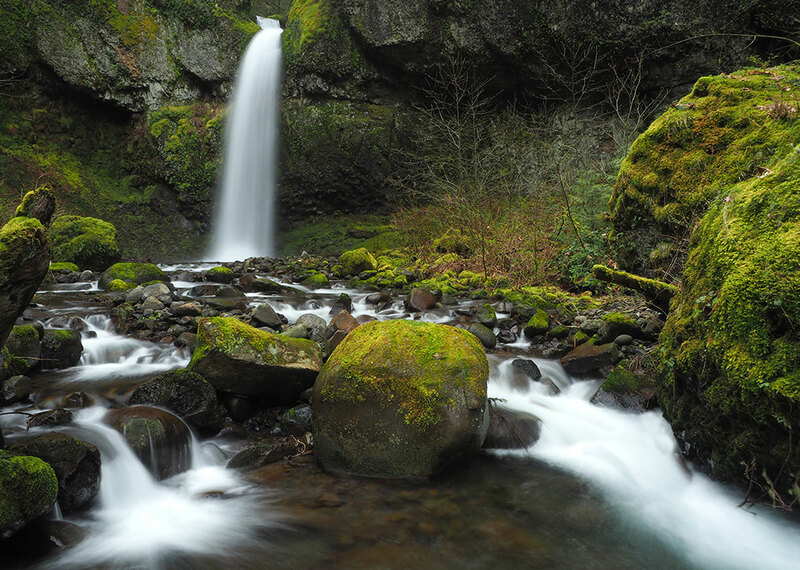 Both trailheads usually have portable toilets, but no water — be sure to carry your own.